And good rice cookers will make things easier, faster and more practical. • 1-10 cup - best for home use. As a rule of thumb: three cups = one - three people; five and a half cups = up to five people; 10 cups = up to 10 people. • 21-30 cup - best for light commercial use. • 31-40 cup - best for medium commercial use (mid-sized restaurant). • 51-60 cup - best for heavy commercial use (restaurants that include rice in almost every dish). • Aluminum - durable, light, and dent resistant. However, it can`t be washed in a commercial dishwasher as the chemicals will erode the aluminum. 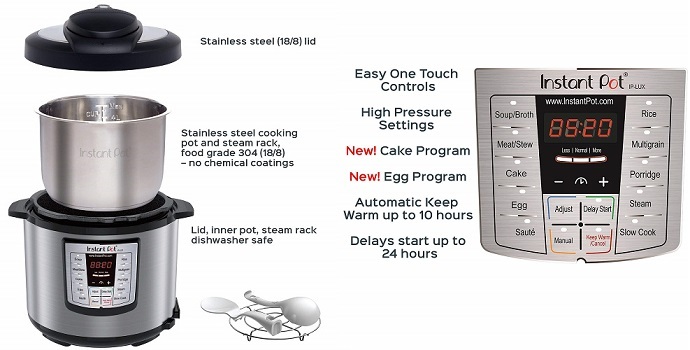 • Stainless steel - can be washed in the dishwasher (given the inner pot is removable). • Ceramic - they don’t often last long in a commercial setting where equipment is constantly being moved around and often dropped. 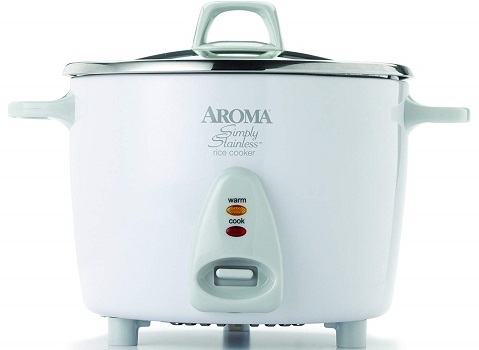 • Multi-purpose rice cooker - also serves as a steamer and slow cooker. 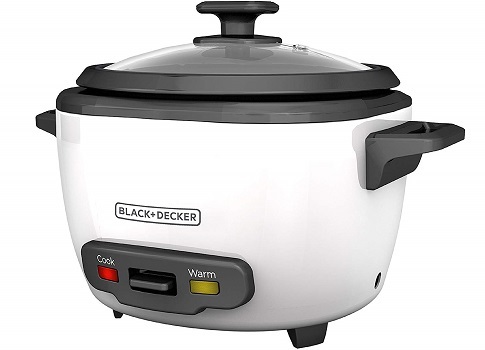 • The outside of your rice cooker should stay cool to the touch. • Removable or retractable power cord - makes your rice cooker easier to store. • Detachable, washable inner lid for easy cleanup. • Texture setting – allows you to select different rice textures, such as regular, soft or firm. • Glass lid – to keen an eye on your rice. • Non-slip feet – to keep your rice cooker stay steady on a slippery surface. • Measuring cup – useful to ensure you use the correct amount of rice per water. There is a great advantage if you buy your first rice cooker online is that you can see directly the opinions of other users. 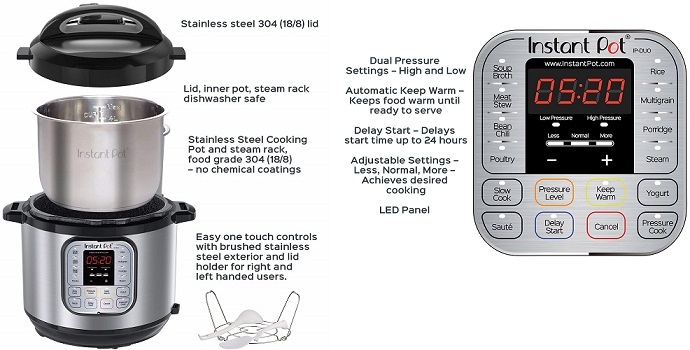 Designed with clear and easy to understand the setting, since all you need to start is press the button that corresponds to what you are cooking. 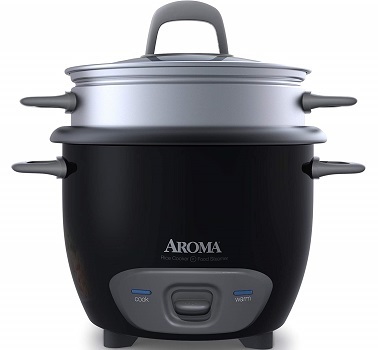 This smart and multifunction rice cooker speeds up cooking by 2-6 times using up to 70% less energy. 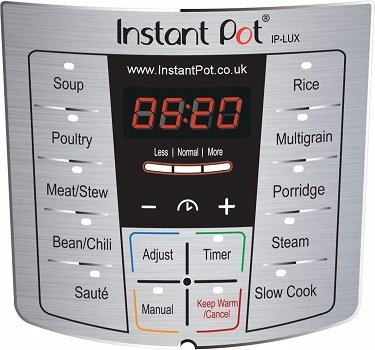 A perfect choice for a busy person, since you can preset the timer to when you want the food ready and automatically warms food after it is done cooking. • Cook food from frozen in less than an hour. • Easy to use with controls that are clearly labeled. • The silicone ring tends to retain odors. • Instruction manual is not well organized. • Only the cooking pot is made of stainless steel, the rest of the unit is not as robust. 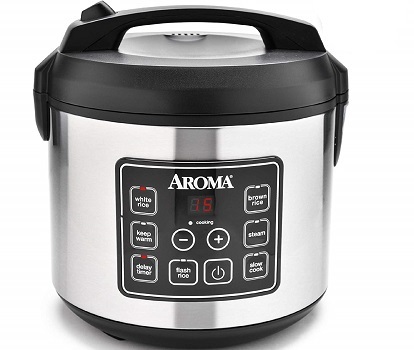 This rice cooker comes with a Flash Rice function that saves time by cut cooking time up to 50%. It also allows you to cook rice and steam meat and vegetables at once. While its minimalist and compact design make this rice cooker be a perfect fit for your kitchen countertop. 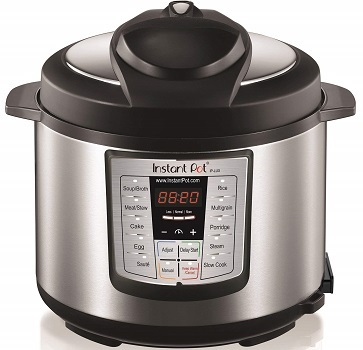 It also armed with a sensor technology which utilizes an onboard microcomputer that automatically optimizes cooking temperature, either lowering or raising it, to enhance flavor and texture. • Delay timer up to 15 hours. • Sturdy and easy to clean body. • Lid stays closed, no water splashes. • The removable non-stick pot comes with measurements on the inside which makes it easy to determine how much water to use. • A bit noisy “beeps” sound. • Doesn’t have slow cooking feature. • Great for soups, jambalaya, chili and so much more! 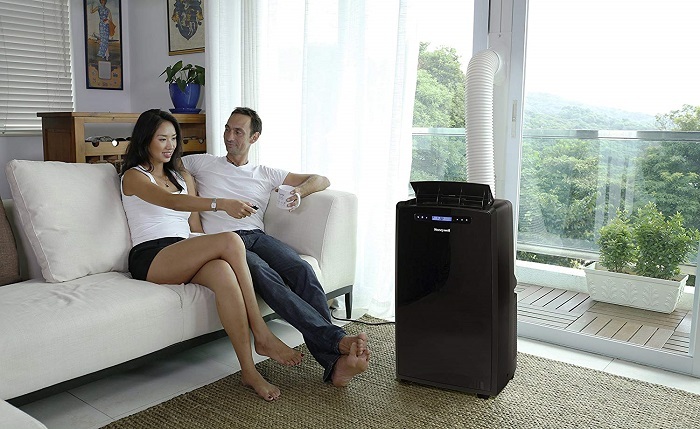 Operating the appliance is as easy as pushing only one button to set the rice steamer to cook, and the unit will automatically switch to warming mode when the rice is ready. It also can be used for cooking whole grains, including oatmeal, amaranth, quinoa, and barley. This entry model is a decent choice, especially for an individual or small family. • Removable glass lid for maximum visibility and easy cleaning. • The stream tray and inner cooking pot are dishwasher safe. • The hole in top lid splatters water sometimes. • A bit hard to read the measurement scale on the side of pot. 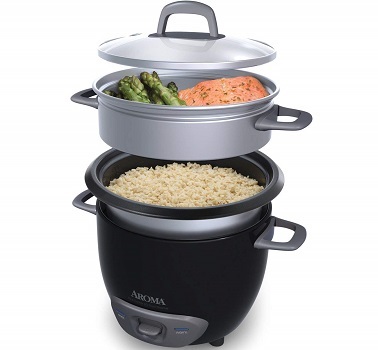 Well-suited for cooking a variety of rice and simultaneously steam healthy meats, poultry, seafood and vegetables. 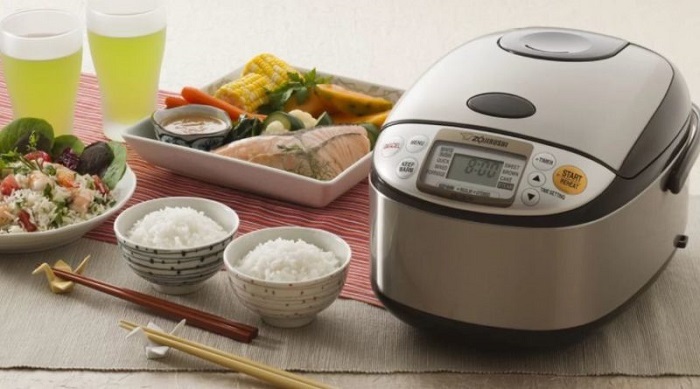 Equipped with “Quick Rice” function, this rice cooker will save you time by cuts cooking time up to 50%. Also, no constant monitoring is required and you’ll be amazed at the quality of rice it can bring. 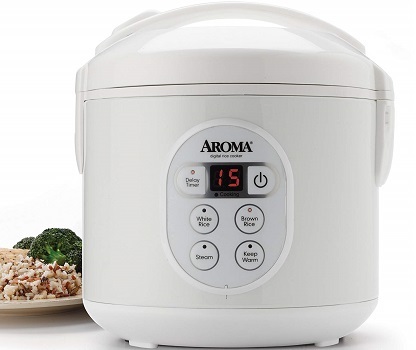 In short, Aroma ARC-150SB makes it easy to prepare healthy meals with minimal effort. While its construction is superb - leaving you no chance to question its dependability. • Contains a water reservoir. • Instructions are simple to follow. • Nonstick Teflon interior that’s dishwasher safe. • Cord & lid is not retractable or detachable. • The lid is attached to the main unit with a hinge, making it hard to clean. • Requires you to soak the rice first or else it will boil over and make a big mess on your kitchen counter. Allow you to cooks 70-percent faster with 3-ply bottom distributes heat uniformly throughout the cooking process and when you’re done cooking. It also comes with 10 safety mechanisms and has been certified by UL. • Can even help reduce your power bills! • Manufactured with extra safety features and certified by UL. • A bit hard to follow instruction manual. • Rubber sealing gasket could retain odors despite repeated washing. It cook your food at a very high speed, plus the food is tastier and much healthier as it is cooked in a sealed and controlled environment, where more nutrients are preserved perfectly for you. Comes with 12 pre-programmed settings, where all of these settings can be adjusted in terms of time, temperature and pressure. For example, the pressure cooker, can speed up your cooking up to 6 times quicker than normal. • The controlled temperature environment makes food very nutritious and tasty. • The 3rd generation microprocessor remembers all your settings. • Keeps food warm for up to 10 hours. • Not as good for slow cooking as a Crock-Pot. • Doesn’t make yogurt, has fewer programs and pre-set temperatures. • Not “Instant”, takes time to build pressure and again to release it when done. • Spillovers tend to leak inside the bottom of the pot – must disassemble to clean inside. Comes in esthetic brushed stainless steel outer body and designed to be smart. Its state-of-the-art microprocessor monitors the pressure and temperature, keeps time and adjusts heating intensity and duration. Even the volume of food is taken into consideration. All this helps to ensure consistency. 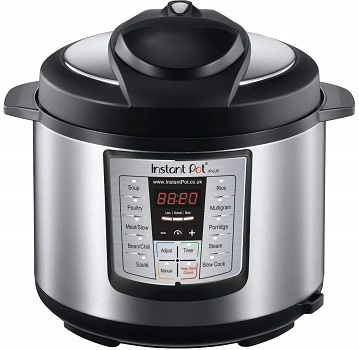 A perfect choice if you want an appliance that can perform both slow and pressure cooker. • Safety lid inspires confidence and really works. • Set it and forget it" really works. • Saute mode doesn't work well. • A bit hard to understand instructions. • Cant cook on low pressure, it doesn’t have the yogurt function, and doesn’t include lid holders. 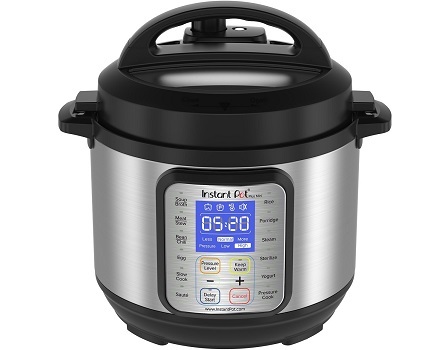 • It takes about 12-15 minutes for this pressure cooker to get to the proper pressure cooking level before it begins to cook. 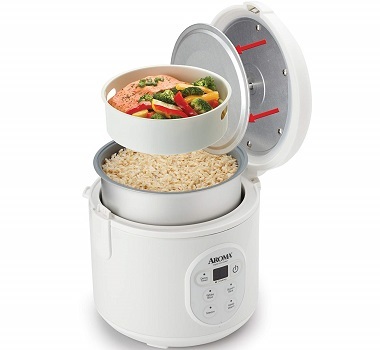 Beautifully prepares any type of rice and even steams meat and vegetables at the same time! Comes with a tempered glass lid to allows you to monitor your foods as they cook without releasing the steam, while the inner cooking pot removes for easy cleanup. • Doesn't burn rice at the bottom of the pot. • Easy to use, looks nice, and the price is affordable. • Sometimes the cooked rice will stick to the pot if you are not measuring the correct amount of rice and water when you cook. Allow you to cook up to 8 cups of rice which is equivalent to 16 cups of cooked rice. Also, it helps you to prepare pasta, oatmeal, risotto, paella, and dishes using wheat, barley, rye, maize, and other grains and cereals. • Easy to clean or wash.
• The non-stick bowl & the lid is dishwasher safe. • Steaming basket, spoon, and measuring cup included. • No automatic on/off switch. • May hold less rice than advertised. • There might be some spillover even if you pour a little more water with the rice. 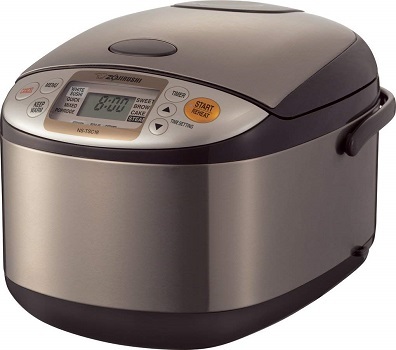 Equipped with a micom chip to control the cooking temperature sequences to produce better rice quality compare to any conventional rice cooker. Zojirushi NS-TSC18 also has several built-in functions that work with sushi rice, brown rice, porridge, steamer, cake baking, etc. Clean up is a breeze as most washable parts are PBA-free nonstick plastic and removable inner lid. • Detail water filling guide engraved in inner pot. 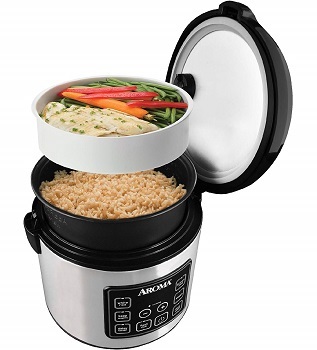 • Multiple useful functions such as baking, porridge, steam and brown rice. • Thermal vacuum design outer body prevent heat loss and keep cooked rice quality fresh longer. 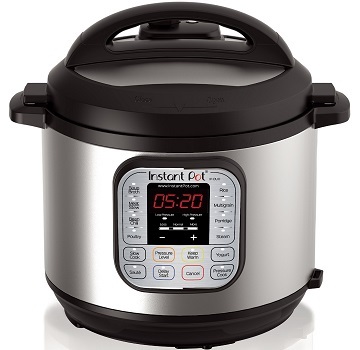 • Twice as slow to conventional or pressure cooker. • Spoon rest is hard to secured. • Easy to clean clear coated stainless steel exterior, 2 delay time settings, stainless brown.